Hoisting the German flag at Mulinu'u, Upolu on 1 March 1900. Kaiser-Wilhelmsland, the Bismarck Archipelago and the Samoan Islands (bordered in red), 1905. The German colonial empire in the Pacific Ocean. German Samoa is shown in red. 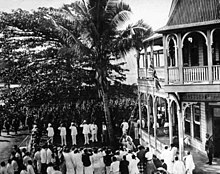 Hoisting the Union Jack at Apia, Upolu on 30 August 1914. Flag of the Governor of the Western Samoa Trust Territory. League of Nations mandates in the Pacific Ocean. 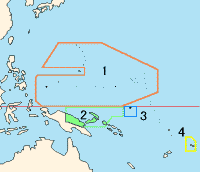 The Western Samoa Trust Territory (bordered in yellow) is number 4. This article lists the colonial governors of Samoa (or Western Samoa), from the establishment of German Samoa in 1900 until the independence of the Western Samoa Trust Territory in 1962. In 1900, according to the Tripartite Convention and following the Second Samoan Civil War, the Samoan Islands were annexed by the German Empire, except for the part that is to become American Samoa. Wilhelm II, the German Emperor, is styled "Tupu Sili o Samoa" ("Paramount King of Samoa"). In 1914, as part of the Asian and Pacific theatre of World War I, an expeditionary force from the Dominion of New Zealand called the Samoa Expeditionary Force (SEF) captured and occupied the territory. In 1920, the territory was turned into a League of Nations mandate, administered by New Zealand. In 1946, the mandate was reformed as a United Nations trust territory and continued to be administered by New Zealand. On 1 January 1962, Western Samoa achieved independence following the passage of the 1961 referendum. For a list of heads of state after independence, see O le Ao o le Malo. ^ Ryden, The Foreign Policy of the United States in Relation to Samoa, p. 574; Great Britain vacated all claims to Samoa and accepted as quid pro quo termination of German rights in Tonga and certain areas in the Solomon Islands and in West Africa. This page was last edited on 12 March 2019, at 13:52 (UTC).